Ecom Turbo Review - The best Shopify theme? Do you have a Shopify store and wonder if the free themes they provide is good enough? Do you want a premium theme, but are afraid that you will be scammed? Read my Ecom Turbo review, and you will know if this is something you need or not. Does Ecom Turbo have support? Who is Ecom Turbo for? Hi there, my name is Richard. I have used Ecom Turbo and I now want to give you my review of this Shopify theme. I remember when I started with dropshipping and Shopify. I wanted to spend as little money as possible and installed a free theme. This was a theme that was recommended in Franklin Hatchett course Ecom Elites. I remember it was the Venture theme, and I really liked the theme. And it was FREE! So I saved money and who doesn’t want to save money? Then it was time to customize the theme. So I did fast and easy customization. This part is something I don’t like, but I know some people that love to design, so they made a bit more beautiful store then I did. The customization in the free theme was limited, but for me it was ok.
After my customization, it was time to add apps. In the beginning, I was used to WordPress where there are much more plugins that are free. For Shopify, most of the plugins cost money. And you need to pay a monthly fee. So after adding a few must-have apps, I was ready to start promoting products. Did I mention that I often needed to edit the theme files to add the apps? I’m a bit tech savvy, so it was ok. 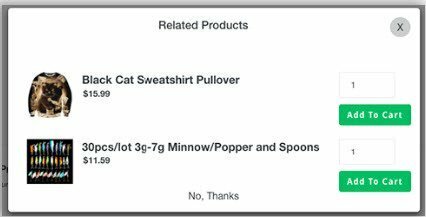 So I started to promote the products, but unfortunately, I did spend more time looking on a thin order list, then spending time fulfilling orders. I also spent a lot of time testing products. To spend a lot of time testing products is ok, but after many products with little to no sales, it’s not so fun and exciting anymore. So I needed to look at the conversion boosting apps. So I installed even more apps, and most of them are paid as mention before. And for every app you install, the longer time your Shopify store loads. Shopify is a fast platform, and your store is loading fast, but after you have added many products and many apps, you will see that your store is a bit slower. And then I asked myself the big question, do I save money with my free Shopify theme? Most of the paid apps didn’t cost much, but together they add up. And after 12 months, the bill was high with the monthly fees. By using a good coded Shopify theme, you have some advantages. One of them is that most premium themes have some apps included. Ecom Turbo is no difference. Another vast advantage is that the different apps are not an addon to the theme, its part of the theme. That way the apps is optimized for speed and do not have any compatibility issues. They just work, and they work fast. Not every premium theme is optimized. And not every theme is made by people that are using them. Many are made to make money to the developers. I have nothing against people that want to make money, but their products should be made of people that are actually using them. Franklin Hatchett is the creator of this theme. He developed this theme after testing different themes, both paid and free. The themes he tested was not what he expected. And he disliked all the apps he needed to install and pay for. Many of the apps are also easy to create. Why should he pay a monthly fee for something so easy to build? So he hired people that created Ecom Turbo. They added all the apps he needed for his Shopify store, and also optimized the theme for speed. Much faster then others with all the apps installed. His experience has taught him that a slow website will lose sales. So after much work, he decided to sell his theme and make it available for other Shopify owners. Especially for those who bought his dropshipping course Ecom Elites, but everyone is free to buy. Ecom Turbo is a fully customized theme, but below I will go through all the benefits you will get with this theme. Speed is crucial. Many times you want to use the advantage of the customer is spontaneous, what is the nature of Facebook customers. If every page takes time to load, the customer can change his mind. Maybe he wants to go back to Facebook instead of loading your slow site. Another thing is that both Facebook and Google are using speed as a factor for showing your Shopify store. They want their customers to have their best experience, and that’s not loading slow pages. So if your store is a bit slow, you will receive a minor penalty from both Facebook and Google. The penalty is lower ranking at google or higher price at Facebook. Another thing is that both Facebook and Google are using speed as a factor for showing your Shopify store. They want their customers to have their best experience, and that’s not loading slow pages. So if your store is a bit slow, you will receive a minor penalty from both Facebook and Google. 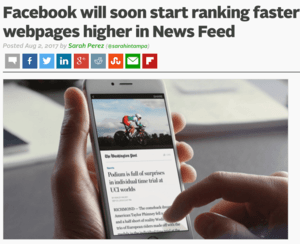 The penalty is lower ranking at google or higher advertising cost at Facebook and Google. I both hate and love scarcity timers. 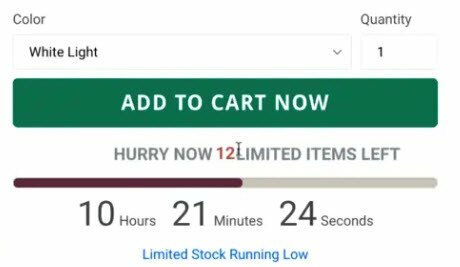 So many Shopify stores are abusing the timers, so please use them ethically. I also know that Facebook doesn’t like them so if you are abusing them, you may get in trouble. Scarcity timers will increase sales, and for some stores, the timers can increase sales a lot. This depends if the demographics you are advertising to is used to timers or not. You can fully customize the timers, so you get the look and feel you like. This function will increase your average order value. All the tests done show that first yes is most difficult to receive. When your visitor has decided to become a customer, the second yes is easier. So by giving them a related upsell, you will increase your average order value. With increasing advertising cost, this is a very nice function. This can turn a losing advertising campaign to a winning one. And will increase your revenue from those who are already earning you money. Pro Tip: If you have a winning product, consider adding more of the same product with a discount as a upsell. You just add the same product with the discount in the product name and with lower cost. Sales popup gives your site social proof. When other people are buying from your store, then this is a legit store in the visitor’s mind. A potential customer can also see this is a popular product and decide to buy in fear of missing out if you have an limited stock. 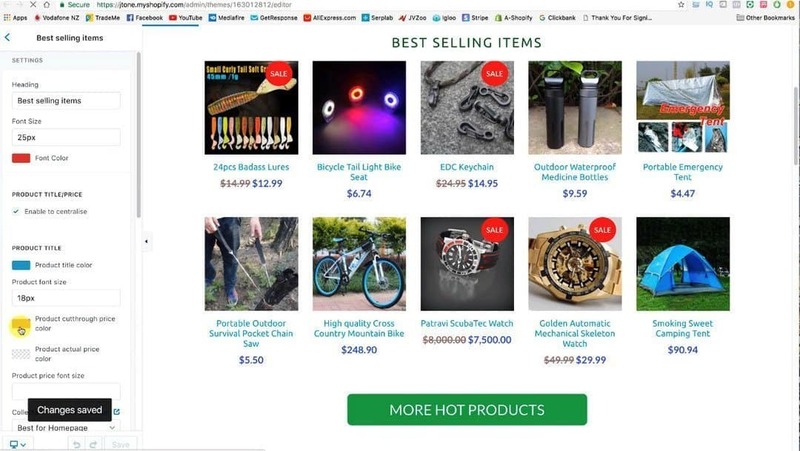 A sales ticker usually shown on the bottom left of your screen. You can customize everything like most other functions in Ecom Turbo. If a visitor tries to leave your store, why not activate the exit popup and give him a discount? Or add a popup after some time to encourage a hesitant visitor to become a customer? 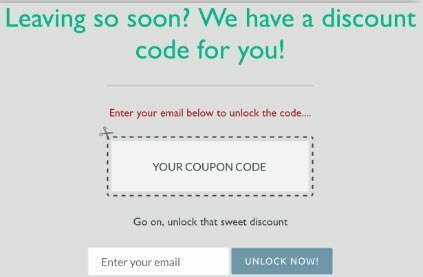 Coupon codes that give a discount are great to increase sales. That way you will also collect email addresses if they decide to leave without buying from you. That way you can promote products to them later and turn them into a customer. This popup is fully customized. Trust badges are great to have in your store, preferably below or close to the add to cart button. This is another function that people have tested that will increase your sales, but the badges need to be real. Don’t put a McAfee Secure badge if your store is not McAfee secure. You want to do everything in your power to increase your sales, but be ethical. This is another excellent function that will increase your trust and reduce both app fees and time to add your own. You can customize the badges as most other functions this theme have. Below is a couple of examples you can choose as trust badge. A majority of the transaction is now on mobile. The price for advertising on Facebook is also lower for mobile than desktop. And sometimes you want to do ads on Instagram that always are mobile. Many themes say they are mobile-friendly, but few themes are so optimized for mobile as Ecom Turbo. This will increase your sales and revenue. I’m not so into customization and want the themes to be optimized before I install it to my store. Ecom Turbo is tested and tuned for conversations, but some people love to design, and then this is the theme for them. This is important, and you want to optimize your add to cart buttons. You can change them to how you like them to be. And you should test them to find what type of button and what color that will increase your sales. When you are advertising, you are sending people to the product page. So the product page is the most important page on your store, but did you know that the homepage is the second most important page? Many people go to your homepage after visiting your product page for more or other products they may want. So use a little time to make your homepage nice and inviting. A screenshot that shows the customization of the homepage. You want everything to be clean and nice. You don’t want to give your visitors links that will tempt them to go to other pages then the product pages, and you don’t want to have a footer that is confusing and big. So use the custom footer in Ecom Turbo to your advantage. With Ecom Turbo you have great support. Franklin Hatchett has a support teame that is ready to help you with the technical issues you might have. You will also get access to a private Facebook group for people that have bought Ecom Turbo. Here will other members and Franklin give tips and help each other with tasks that you might find difficult. Or just some more tips. With a fully customized theme, it’s easier to get lost then a theme where you are limited to change colors only. So if you have a “Where do I change …” question, other members and Franklin will help you out. You can also send in a request for more functions. If enough people ask for it, Franklin will implement it in the theme for free. And I suppose if Franklin also finds your request beneficial, he will implement it sooner since he is also using this theme. What do you think about my Ecom Turbo review? I will be very happy for your feedback in the comment section. Free themes are usually easy to use. Most premium themes are also that. With Ecom Turbo you will receive a training portal with over the shoulder training in how to use the theme. How to use the different functions with best practice advice. You will also receive a mini-course in e-commerce. So with this theme, you will actually receive everything you need to be successful. The e-commerce training is not so detailed as Franklin Hatchetts dropshipping course Ecom Elites, but you will receive the basics. Ecom Turbo is for everyone that use Shopify to sell products. If you don’t like scarcity timers, don’t use them. If you don’t like email popups and sales popups, don’t use them. But you will love the speed and how optimized this theme is for mobile. And you will save some bucks or time if you are using the recommended apps that is built into this theme. I also believe you will benefit from the Facebook group regardless of what you are selling. Franklin Hatchett will answer with his extended knowledge and experience. You receive a lot of value for your money. You save money by using the in-built apps. Fully customized theme if you love to design. Great support from the support team, Franklin and other members. The training portal that gives you training in both the theme and ecommerce. You are limited to Shopify checkout. There are themes out there that are better with its own order pages, but the price is way higher. Shopify has some limitations, and the biggest one is the checkout process. When your customers decide to order from you, they are sort of leaving your store and going to the Shopify checkout. This is pages you have less control over and can’t customize so much. For a little over two years ago, your customers were actually leaving your domain and entered the Shopify checkout domain. Now your customers are no longer leaving your domain that improve both branding and trust. There are themes out there that will increase your sales and customization even more, but they are bypassing the Shopify checkout. They have their own checkout with improved functionality and is priced way higher. Another limitation is that you can’t update a theme in Shopify. Shopify is not like WordPress where you can update the theme and keep all the settings. This is a significant disadvantage with Shopify, so you need to install themes that is stable with no bugs that give your customers a bad experience. Ecom Turbo is way beyond the testing phase, and every new functionality is added after they are tested. Ecom Turbo is an excellent theme to an affordable price. You don’t find other themes out there with more real value to $97. You don’t need to install all the addons you usually install, and then you actually will save money if you buy this theme. I learned this the hard way. Most people say go for a free theme until you are making money and this advice is sort of true. The problem is that a premium theme will increase your sales and this difference will give you some extra sales in the beginning. The is a huge motivation boost instead of testing product after product and receive very few sales. So if you have decided to go for e-commerce, I highly recommend you to buy Ecom Turbo and work with your store until you are successful. This theme will both save you money from paid apps and increase your conversations, so this is no brainer. If you are just testing if Shopify and ecommerce is something for you, go for a free theme. If this is something you want to go for, you should consider buying Ecom Turbo. I hope you enjoyed my Ecom Turbo review and if you have some questions, I love to answer them in the comments below. Neet a Premium Shopify Theme? Description: A Premium Shopify Theme made by Franklin Hatchett. 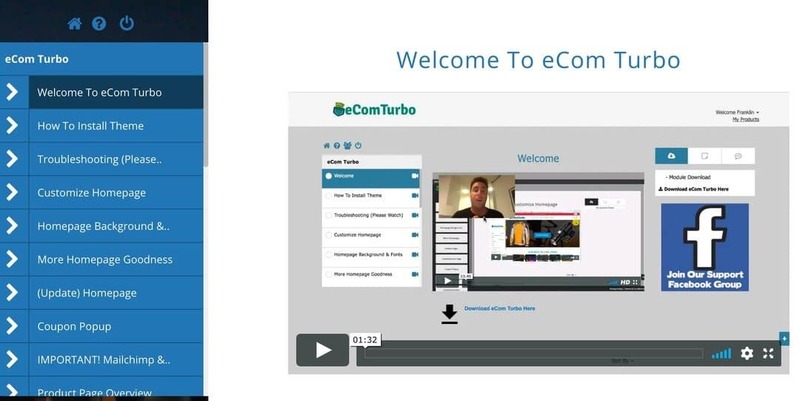 Receive full training and support in how to use Ecom Turbo on your Shopify store.